LOGANVILLE, Ga. — Former Atlanta Braves pitcher, John Smoltz, surprised Clint Frazier of Loganville High School by presenting him with the news that the Gatorade Company, in collaboration with USA TODAY High School Sports, named Frazier its 2012-13 Gatorade National Baseball Player of the Year. Former Atlanta Braves pitcher, John Smoltz, is one of our more popular motivational speakers, says SportsSpeakers360.com. The photo shows Smoltz speaking with DLHQ on ESPN. The award, which recognizes not only outstanding athletic excellence, but also high standards of academic achievement and exemplary character demonstrated on and off the field, distinguishes Frazier as the nation’s best high school baseball player. Frazier is now a finalist for the prestigious Gatorade Male High School Athlete of the Year award, to be presented at a special ceremony prior to The ESPY Awards in July. 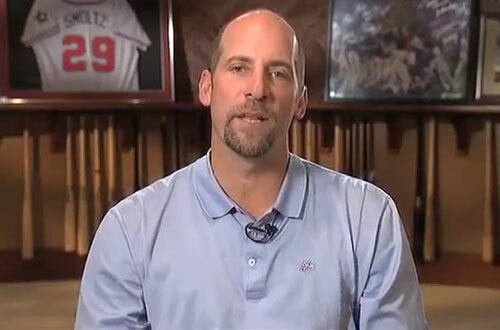 John Smoltz, considered one of the greatest Major League pitchers of the late twentieth/early twenty-first century, is only one of two pitchers in baseball history ever to achieve twenty wins and fifty saves in single seasons. Sports Speakers 360 is a sports talent agency for booking athletes. If you would like to book baseball speakers or MLB stars like John Smoltz for a speaking engagement, autograph signing, VIP meet and greet, charity fundraiser, guest appearance, baseball camp, product endorsement, social media campaign or special corporate event, you can request John Smoltz agent and speaker fee information at SportsSpeakers360.com. For booking agent and appearance fee information on how to hire Atlanta Braves players for appearances, call 1.855.303.5450.